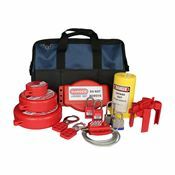 Lockout kits provide a convenient way for operatives to access or carry a range of popular lockout devices, such as safety padocks, lockout hasps, clamshell lockouts and cable valve lockouts. This enables engineers to always have the right tools at their disposal to effectively and safely lockout devices as required. Kits come in various configurations - please contact us for more information about all ranges available.